We take pride in our 100% safety record here at Rivera Mascots & Bounce Torbay and put the safety of our users at the forefront of everything we do and with this in mind we feel we need to send out clarification on what to look for when hiring from us or any other reputable inflatable hire company to ensure a safe hire at your party or event. 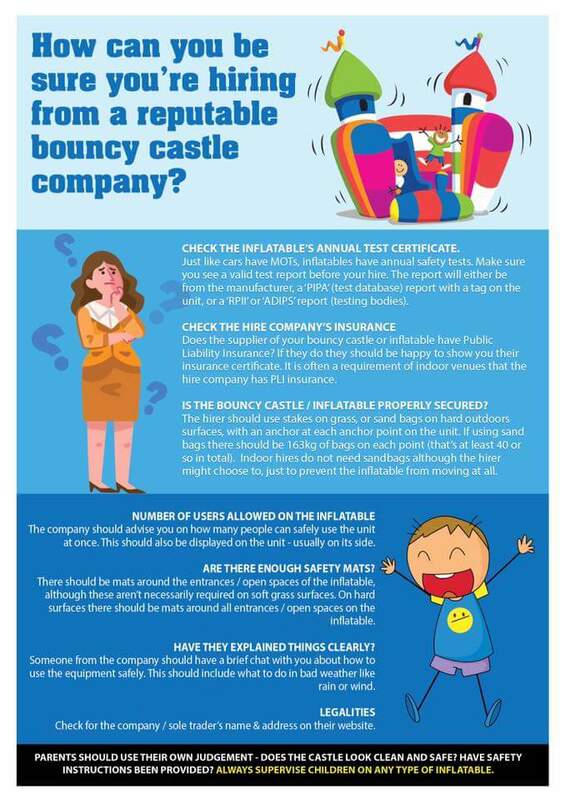 Most importantly each and every inflatable requires an annual test certificate to be either carried out by a Rpii or Pipa Inspector and must also have public liability insurance for each individual inflatable or any other hire equipment. (Please feel free to contact us for our details of Insurance and evidence of our test certificates and we will be glad to provide these to you or your venue) NO test means NO valid insurance please ask for these when booking any inflatable from us or anyone else. Every inflatable hired needs to be anchored securely to strict HSE regulations and every anchor point on an inflatable needs to be used when outside, we only set up on grass as we feel concrete or tarmac is not safe as adequate anchorage can not be obtained unless the inflatable can be drilled into the ground to secure it. (If you ever see an Inflatable outside with only sandbags on it to secure it, this is totally against HSE reguations as each anchor point has to have 164kg of weight on it and a sandbag only weighs 25kg maximum) We will not setup up if we arrive and we cannot anchor all anchor points into grass. For stability we use sandbags indoors which helps keep the inflatable in place. The hirer of any inflatable and equipment is responsible at all times to make sure their guests use the inflatable/equipment safely and in a proper manner and we always go through a safety briefing with you once the equipment has all been set up.